A lot went into this one, I spent hours in front of the computer fiddling with the color balance. This is my first HaRGB combo, so took some getting used to. Enjoy! (And thanks for helping me get this far). Object details: Barnard 33, otherwise known as the horsehead, is the dark nebula in the lower left corner. IC 434 is the red emission nebula behind it. 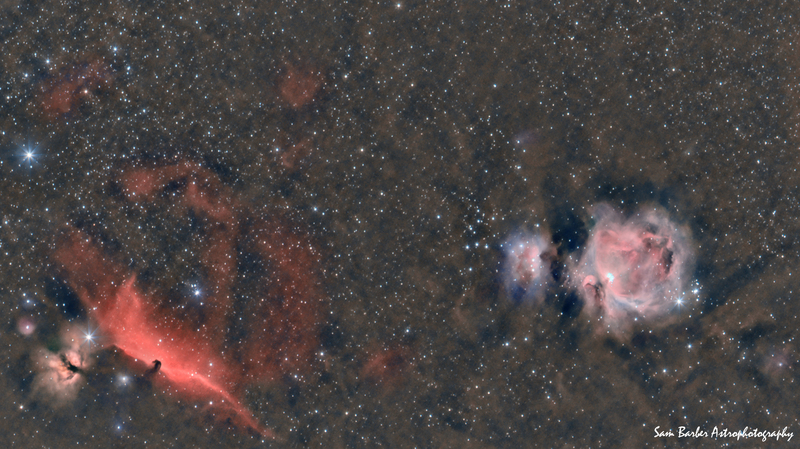 NGC 2023 is the blueish reflection nebula under the horsehead, while NGC 2024 (the flame) is to the left. M 42, the grand Orion nebula, dominates the right half of the image. The running man nebula is a reflection/emission nebula to the left of M 42. Numerous dark nebulae fill the frame as well.